In September 2018, JustCo is delighted to announce a collaborative effort with Singapore Management University Alumni Association (SMUAA). Established since July 2005 and run by alumni volunteers for alumni, the SMUAA leads SMU alumni in creating social impact and harnessing the power of the alumni network. Overseeing all local and overseas SMU alumni groups and chapters, the SMUAA facilitates networking between alumni groups, nurtures and supports alumni leaders, and grows the alumni network. SMUAA comprises future leaders, adventurers, explorers and budding entrepreneurs, poised to take on leadership roles in their organisation and in society. They also possess the determination to embark on entrepreneurial endeavours. Singapore has grown to become a hub for aspiring entrepreneurs and a recent finding from Channel News Asia revealed that, start-up founders based in Singapore were the youngest in the world, with a median age of 28 and 32% saying they started their current business while they were still studying. Whilst all entrepreneurs face challenges when starting their own business, young entrepreneurs face fiercer complications. More often than not, these new start-ups are short of suitable office spaces, network connections, proper tools, equipment and resources; which are easily accessible in today’s co-working model. Hence, in support of these young entrepreneurs, JustCo unveils its latest exclusive collaboration with SMUAA, named the SMUAA Start-up Hub powered by JustCo. Located within JustCo’s newest and largest co-working space at Marina Square, the SMUAA Start-up Hub powered by JustCo will occupy a dedicated area of the centre. What’s more? SMUAA members will be automatically connected to JustCo’s large community of talented and like-minded businesses, where they can explore new business opportunities and leverage on a common pool of resources to drive success to their business. This start-up hub ultimately aims to encourage interaction, knowledge sharing and collaboration amongst entrepreneurs through regular social and professional events organised at JustCo! In addition, as many entrepreneurs are constantly seeking for workplace flexibility, members are not limited to work from Marina Square’s co-working space only. 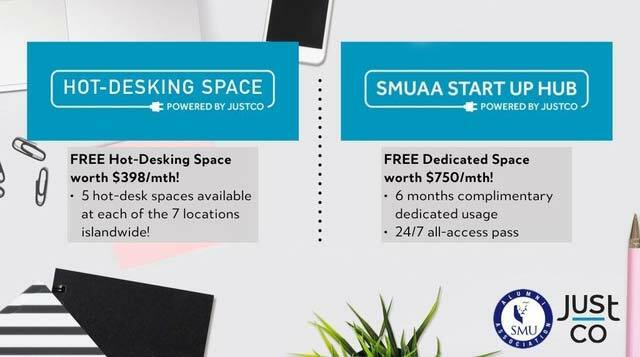 JustCo is also value adding members by offering complimentary hot-desking work stations across seven co-working centres in Singapore, which aims to increase productivity among members! Started since 2015, JustCo has always been connecting vibrant and dynamic communities in open, conducive and creative work spaces and we look forward to welcome SMUAA as part of our ever-growing community! This exposure can bring needed awareness and inspiration, so they can find purpose and meaning in their own work. It can also help them expand their network and meet new people. Moreover, coworking spaces encourage collaboration and learning among its members which helps business managers and employees alike learn the value of helping one another and working harmoniously to achieve desired goals. If you are a freelancer, an entrepreneur, or a manager who is looking for a virtual office in Singapore that would be most beneficial to your line of work, get in touch with JustCo today. JustCo offers premium coworking spaces and shared offices to suit your needs.